The integrity of a stowage unit manufactured from composite honeycomb sandwich panels was assessed by Wilde under both g- and vibration loading. For a fan blade off event in the main engine, vibration loads in the engine and airframe will develop as a result of engine imbalance. 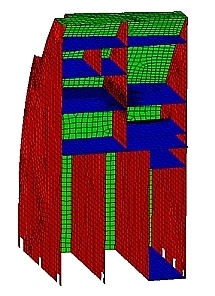 This windmilling effect was investigated by a natural frequency analysis. The natural frequency analysis was run to establish whether any frequencies occurred within the excitation range 8-20 Hz. For frequencies within this range, an amplification factor of 10 was applied to represent an assumed damping level of 5%. Reaction forces at the attachment points from the combined loading were determined and presented to the client.